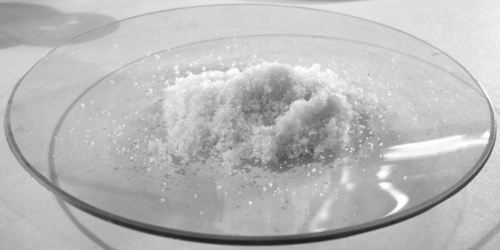 Ammonium carbonate is an unstable pungent soluble white powder that is a double salt of ammonium bicarbonate and ammonium carbamate: used in the manufacture of baking powder, smelling salts, and ammonium compounds. It is also known as baker’s ammonia or hartshorn. Its formula: (NH4)HCO3. (NH4)CO2 NH2. 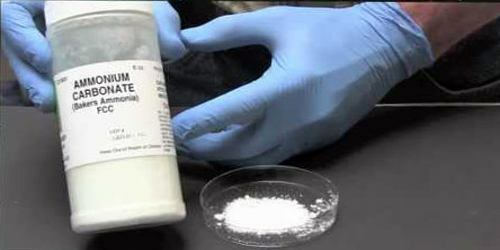 It is a colorless crystalline solid or a white powder with a strong odor of ammonia. Noncombustible. The primary hazard is the threat to the environment. Immediate steps should be taken to limit spread to the environment. It is used as a leavening agent and also as a smelling salt. 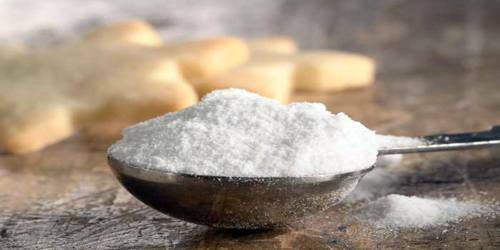 It was a predecessor to the more modern leavening agent’s baking soda and baking powder. It is also used in some smokeless tobacco products and as an active ingredient in cough syrup to relieve the symptoms of bronchitis. It is known that processes for the production of ammonium carbonates which comprise interaction of gaseous ammonia and carbon dioxide in the presence of water, both as vapours and liquid. the production of ammonium carbonates from liquid ammonia, carbon dioxide and water vapours, wherein the desired product is formed within the reactor working space in the form of fine particles which fall to the reactor bottom and are discharged by means of a screw conveyor. The process is conducted at the temperature of 10° C. under the pressure of 80 mm Hg. The reactor walls do not participate in the heat removal and the product is not formed thereon, since the heat evolved in the reaction is compensated by evaporation and expansion of liquid ammonia. Preparation of ammonium carbamate from liquid ammonia and liquid carbon dioxide by bulk condensation is carried out in an excess of carbon dioxide, full utilization whereof for increasing the desired product yield is only possible after purification from ammonia and liquiefaction which again hinders the process. 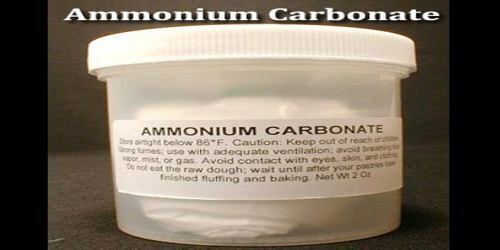 Ammonium Carbonate is water-soluble and decomposes in hot water. It is a white powder that is used as a leavening agent in flat baked goods. It is also the main component of smelling salts. Its use as a leavening agent goes back centuries. It is the predecessor to the more modern leavening agent’s baking soda and baking powder.